The idea for this series began when my cousin was threatened with eviction. The landlord of her rent controlled NYC apartment complained that she had too much clutter and had created a safety and health hazard. I volunteered, along with some of her friends, to help her clear out the 52 year accumulation of stuff, mostly paper and mail that covered every surface and practically every inch of floor in her small dark apartment. Over a period of two months I traveled into Manhattan eight times to work eight hour days organizing and cleaning up her place. While there I took digital photos to document the enormity of the undertaking and to provide evidence of progress for her attorney and the landlord — that she was making a sincere effort to clear out the clutter. She was granted an additional month until her eviction case would come before a judge. I understood how difficult, traumatic even, it was for my cousin to part with many of her old, seemingly useless things. I myself have great difficulty throwing things out. And as an artist, a creative person, I can always imagine a possible future use for just about anything. But our goal was to "save the apartment" — a daunting task, physically and emotionally for all involved, but especially for my cousin. I'm happy to report that the manager has inspected the apartment, was satisfied with the orderly condition seen there and the eviction threat has been withdrawn. The experience got me thinking about my own hoarding tendencies, my own possessions — the things I buy, the things I save and the reasons, justifications and excuses for keeping it all. I started to document my own collections and some of family and friends. 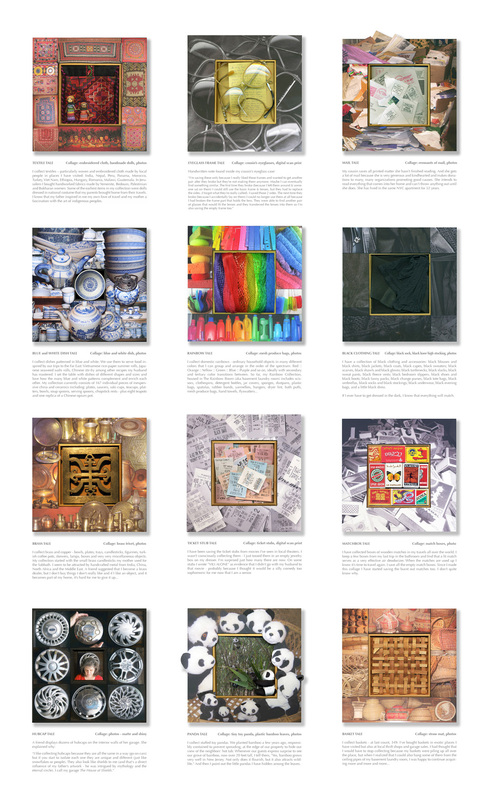 I created these 10 x 10 inch assemblages combining actual "precious" objects with digital imagery and explanatory text. These assemblages are my ongoing exploration of the stuff in my life — part inventory, part memoir, part confessional.